As many of us get ready for the holiday weekend, we want to wish all of you Happy Thanksgiving! This is my first Thanksgiving in NYC, so I’ll be heading to the Macy’s Thanksgiving Day Parade in the morning then home to cook a big dinner for visiting friends. I’m also looking forward to doing a bit of sewing and starting an ambitious hand embroidery project over the long weekend. 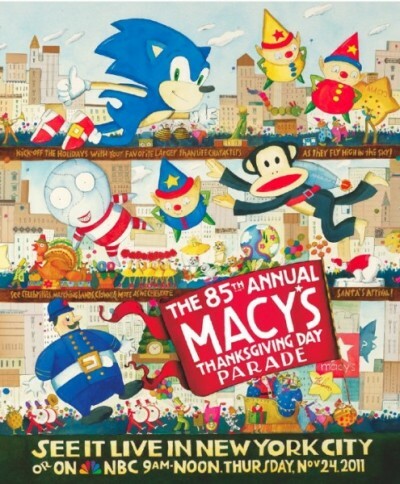 Illustrator Melissa Sweet designed this year’s Macy’s parade poster. She is also a fan of Lisette patterns! To find out more about Melissa and get some great ideas for kid’s activities to do over the weekend check out Liesl’s recent Disdressed blog post here. Let us know your plans for Thanksgiving and have a great holiday!